The link should work now. Thank you for the note! Suzanne, you are a JEDI, thank you from the bottom of my heart and, more importantly, from the hearts of our investors trying to understand the mysteries of EB-5 processing! Charlie’s prediction of 14 years for Chinese investors contains obvious mathematical errors. In fact, it has been a consensus in China that Chinese investors who invest now have to wait at least 25-40+ years, assuming that there are no legislative changes. Charlie Oppenheim wrongly assumed that the number of applicants pending at NVC = the # of Chinese individuals pending at NVC. This is NOT true. In fact, Chinese investors will not be allowed to add their family members to the NVC list until a few months before their visa interview. Therefore, the NVC number largely underestimate the real wait list. As a result, the real number at NVC should be roughly doubled (if not tripled) to reflect the actual wait line. This can easily bump up the wait line to 25 years+. This case does not apply to non-Chinese investors. As of now, non-Chinese investors are allowed to add their family members to NVC immediately after I-526 approval. Therefore, their pending numbers at NVC can represent their actual wait list. China is a completely different story. Thank you for this comment. When Charlie Oppenheim made his prediction, Robert Divine did speak up to say that the China numbers might be undercounted due to family members not having been listed in some I-526 filed before 2015. I’ll add that caution to my post. Also, we neglected to ask Charlie what assumptions he used about future rest-of-the-world demand. China, India, and Vietnam are the only countries with a particular wait time, based on volume and visa availability. Ireland is no where near the visa cap, so I-526 processing time is the major factor for Irish. 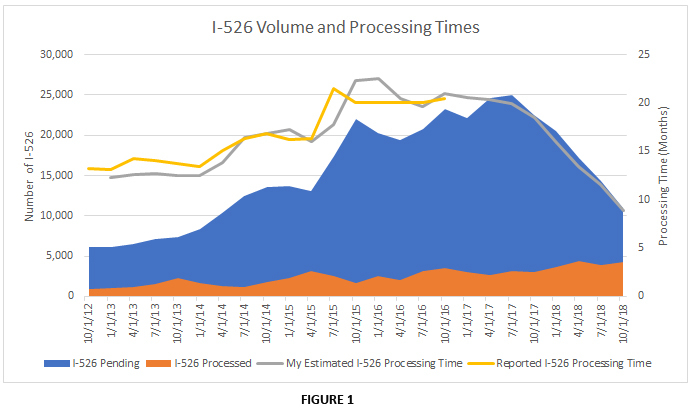 Averages would suggest you’ll get I-526 approval around June 2019. You could be approved any time. Have seen a lot of Dec 2017 approval come through. Suzanne, thanks for doing an outstanding job. You’re a great help. I myself was saying the same thing to my brother that it’s extremely unlikely that an Indian who filed today would get their temporary green card within 72 months of filing their petition, and today you said the same thing. Can you please elaborate why you think it would be more than 72 months for Indians? Total number of pending visas are 4000 + Indians, even if we only calculate allocated 700 visas per year, it should be anywhere in between 60-72 months, not considering some visas may be available to Indians from the balance pool. 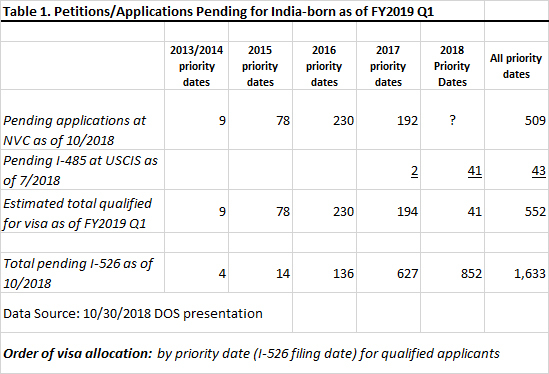 I spoke with a few regional center reps that recently visited India in the past 8 weeks, and they said that most Indian families have 4 family members per visa petition, and if this is correct, USCIS and US DoS figures are way off base. Even if it’s only 3 members per petition, it’s about 280 petitions per year before the Chinese gobble up the rest, and if 1633 petitions are pending, I’ll bet my bottom dollar that at LEAST 5000 visa numbers are going to be used up, if not 6500, which means that we’re looking at at least a 7 year wait to get the temporary green cards, if not 8-9 year waiting period. 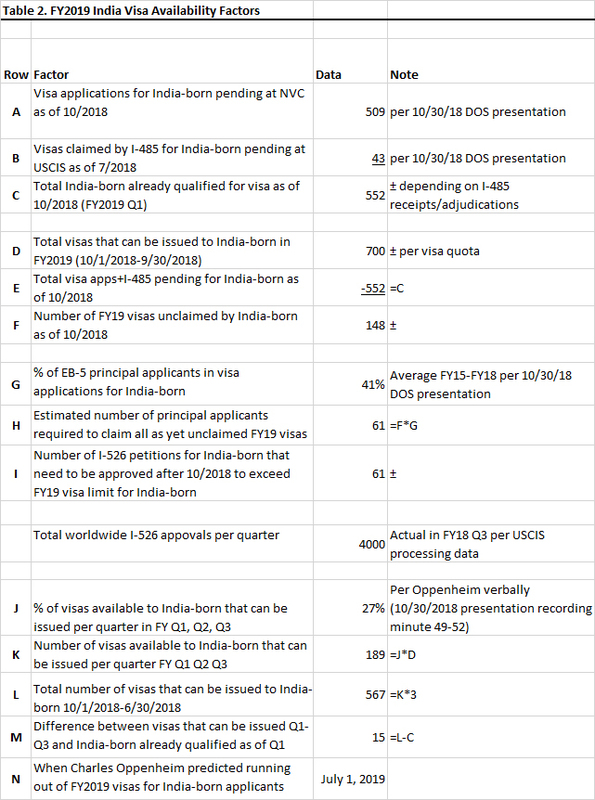 See https://www.eb5daily.com/eb-5-visa-filings-from-india/ and also the article posted by Suzanne on 10/25/2018 (Pending I-526 by country as of 10/2018). I’m beginning to think that Canada is a safer and faster option, because even if we choose EB-1C visas over EB-5 visas, it takes 2 years to get the permanent green card, and if we choose Canada, we’d get a permanent green card in about 6-8 months, and a Canadian passport in a lot less time than it takes us to get a temporary green card under the EB-5 visa scheme. Trump can keep his chaos and BS, and I’d rather vote with my wallet. Right now, I’m just waiting to see what happens in December, because if the USCIS increases the amount, EB-5 visas will anyway be unaffordable for all of us, and then we’ll have to choose between EB-1C category visas or Canada. FYI the average number of family members per principal for India in the calculation is based on historical fact for visas issued in the last three years. I guess that the number is low on average thanks to the number of young Indians on H1B in the US transferring to EB-5. Suzanne, now most of the EB-5 visas are from India. What do you think is the number of visas each petition takes when it’s now H1B cases but now most of the cases are from India and have a bigger family size? I will give you a perspective which might help. So as you have mentioned, immigration difficulties for Indians is beyond anybody’s imagination. However I do not blame USA for it. Not Trump or any other politician. Fact is USA made all these rules before and same for all with 7% cap etc. Keep in mind that Indians have predominantly benefited from spillover EB2 and EB1 in the past. After Martin Luther King’s change of the course of human history, we have legally had same rights to immigration. What has happened in last 15 years, is just too many of us have come to US and choked the system. Now please keep in mind that I have been in this country since 2007, trained as a super-specialist doctor for 7 years, did something which has never been done contributing to many many American’s lives but when it comes to immigration and life, I am just a Visa slave. So finally I applied for EB5 ( with everything I have and secured loans) and is awaiting approval. In your case, it all depends on how important it is for you to be a US resident. 1. If it is not very important, you can immigrate to Canada and lead a very good life in a country which in my opinion is better than USA on many perspective. Unfortunately for me, its not an option as I will have to go through licensing etc . Also in medicine, not much opportunities. However things might be different for people in IT and business. 2. If US is so very important to you and your family, then you could move to Canada and wait for EB5 which I anticipate to be anywhere between 8 – 10 years if you apply now. I do not know why US Green card has become suddenly so lucrative and this mad rush choking the system. Must be something which US offers which other places don’t. Right ? Dr. Ojha, we’re looking at EB-1, through which we can get the permanent green card in about 2 years, as an alternative as we’re keeping our options open. I am personally leaning towards Canada, because it’s a cheap and easy workaround while my EB-2 visa is being processed. Hope your Eb1C application succeeds. However as you are probably aware, what used to take few weeks is now taking 2-3 years. I have colleagues and friends, who have expedited Eb1A approved from March 2017 and still waiting for interview date. As per Chen ( predominant EB1 lawyer for Doctors) , they might have to wait till late 2019 or early 2020. Also Eb1C has lot more scrutiny now. Eb1C has been misused a lot, as you are aware. Good think in your favor is that you can possibly port your EB2 priority date. The “priority date” means the date the application was received at USCIS? I am applying for I-526. Sri Lankan Origin, a Canadian citizen. What will be my priority date both for I-526 and NVC and the visa allocation? Thank you. Your priority date would be the date that you filed I-526. But since you were not born in China, Vietnam, or India, you do not need to worry too much about the priority date. A visa will be available for you as soon as you are qualified for it. I really appreciate your contribution for helping us all. I applied from Pakistan in Dec 7, 2017 in one of the exampler project. But still waiting on approval. My question is what you think when I will get approval and after approval how much time will take to get visa? What did you mean by ” as soon as I am qualified for it” please? Is it as soon as the I-526 is approved? How many months after I-536 approval would I hear from NVC? The DHS calculation is impossible to be correct. There is no way we can use simple linear regression for this backlog prediction. The correct estimation for Chinese invested today will be around 50 years, if no policy changes. I am learning that you introduced a bill with Senator Chuck Grassley that would terminate the EB-5 Regional Center Program. Thanks for your efforts for the good of EB-5. However, it might cause damage to EB-5 investors. If termination is a compelling choice in such a chaos and powerless situation, please show some mercy to us, hopeless EB-5 investors. Please add some additional policies to protect our money after termination. As far as I know, only a few regional centers have clear Sunset policies to refund investors within 3 years after termination. That means many investors have no refunding policies protection after termination. Please help clarify the refunding process and timelimit after termination. Speaking of refunding, many Chinese investors want to refund after knowing the truth of serious visa backlog problem. However, we were told that according to PPM we cannot get refunding until I829 submission or approval, or NCE due to dissolution, both or which take more time than waiting time caused by visa backlog. Now, in the name of PPM and 15+ years waiting time, regional centers can accupy our money forever, even though we want to give up green card application. Even when the first investment project have reached the refunding time, many regional centers can continue to redeploy our money to the 2nd project according to PPM, ignoring that some of us want to give up immigration process. They take advantage of the unfair PPM we signed before to exploit us endlessly. When we signed PPM before, we were not told the ture waiting time caused by visa backlog. I don’t believe US can tolerate such unfair and dishonest business behavior. Please help clarify the refunding process for those who want to give up immigration process, thus to clear US’s name. Investors estimate China-mainland born #EB5 waiting time is 31.8 years, but USCIS’s Immigrant Investor Program Office estimated it was 14 years. Which one is correct? According Charlie ‘s Chinese backlog prediction, From 6 years, 9.8 years, 15 years, 14 years in last 2 years, So many Chinese become victims. from this lesson, We also suspect Vetland and Indian backlog time would be much longer, not as what Charlie . Just keep in mind that this is a waiting line problem. It’s like the question: “How long does it take to get seated at the restaurant?” In just one evening, the steward gave these predictions: 5 minutes, 20 minutes, 40 minutes, 10 minutes. All predictions were correct. How could that be? It was “5 minutes” to the person who came at 4 pm, “20 minutes” to the person who came at 5 pm, “40 minutes” to the person who came at 6 pm, and “10 minutes” to the person who came at 8 pm. Each person’s wait time depended on the number of other people waiting at a given point. Charlie’s predictions may be too short, but it’s no surprise that they vary since each is specific to a point in time, and the volume of other people waiting changes between points in time. Sorry if it’s off topic. 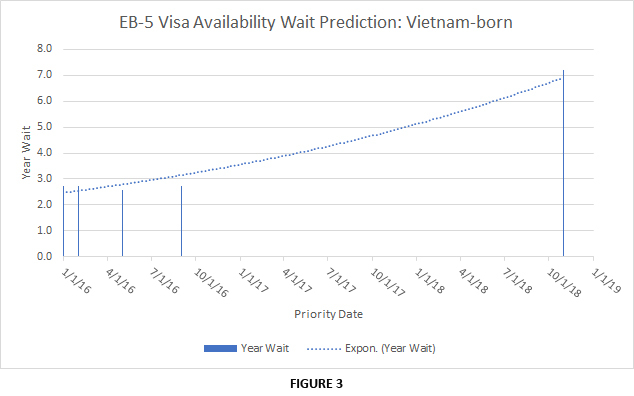 Does Suzanne or anybody else know approximate wait time for visa interview for EB-5? I am asking specifically about this stage of consular process. I heard it depends on how busy embassy is. But I try to understand approximate minimum maximum wait time. I will be going to London embassy, if it helps. Reasonable estimation is around 10-14 months without a backlog for a consular processing. I am Indian and filed my EB5 petition on May 1, 2017 and still waiting for approval. Can you provide some guidance on when I can expect approval and what is a realistic scenario for my green card timing. I estimate that you should get I-526 approval any time now (my prediction model guesses 1/10/2019), and that a visa will be available in 2020 or 2021. But your lawyer may give a better estimate based on knowing the details. Thanks Suzanne.. will keep you posted on developments to provide proof point for your prediction model. I was just wondering in your experience are the processing time predictions laid out above proving to be accurate or not? Thank you for putting in so much effort to make such a great blog! Hi Suzanne – we are looking to file EB5 later this year (already on H1, EB2 PD June 2011 India) – what is the anticipated wait time? Just trying to figure out if EB5 would actually be beneficial for us if the wait time is going to be 10 yrs or so. In a couple weeks, Charles Oppenheim of Department of State will speak at the IIUSA conference, and should give us numbers that allow estimating the current wait time. The estimate for India-born will certainly be over 6 years, but I’d guess under 10 years. In my opinion, any wait time over 5-6 years is too long because such extended time pushes investment and immigration risk to unacceptable levels (what with risks from material change and redeployment under current policy). That’s aside from personal issues related to immigration timeline and child status. Personally I would hesitate to invest until either more visa numbers become available or policy changes to mitigate risk over long wait times. Hi Suzanne- any guesses on how long it would take for Indian origin EB 5 filed later in 2019? We have EB2 PD in June 2011 (India) and are trying to determine best approach.